A forge steel process is an establishment where metal is shaped, usually be heating and hammering. Both ferrous and nonferrous metal can be forged, including low carbon steel, copper, and titanium. 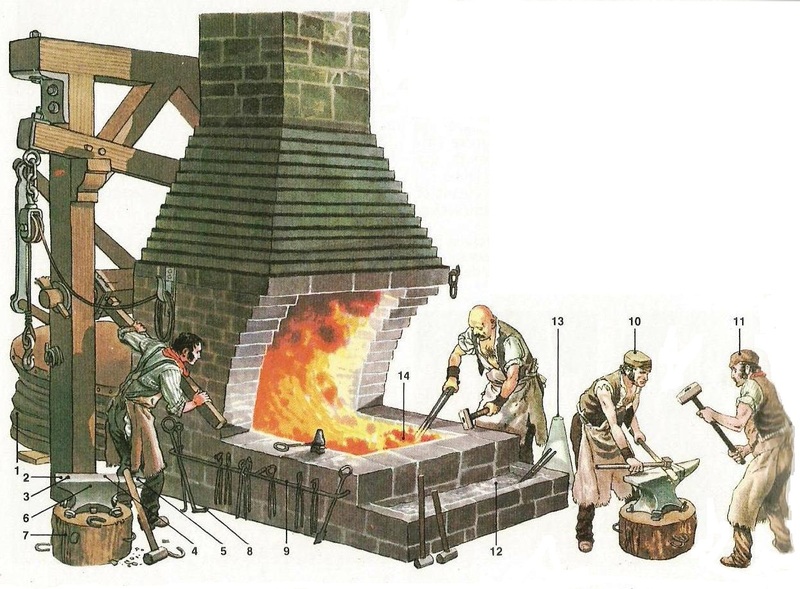 A forge may be distinguished from a foundry, where metal is melted by furnace and cast from molds. Wrought iron may also be produced by forge process. Forging is accomplished by the use of hammers, dies, and mechanical presses, and by method known as roil forging. All these methods work by applying pressure to a properly selected size of metal block, known as a billet, which is heated to the proper temperature. Hammering has evolved from the hammer and anvil of the blacksmith to large drop hammers. The blocks of metal may also be shaped by the progressive use of dies, tools with cavities and contour previously cut into them. The method of pressing uses a motor driven ram or hydraulic pumps to apply pressure to the metal. Roil forging is used to shape metal into long, thin sections. The roils are semi cylindrical and have several grooves machined into them through which the unshaped billets pass from one size to the next. The metal is forced to conform to the size and shape of the groove. Forging is widely used because it is a mass production technique that can quickly make similar parts. A well-equipped 19th century blacksmith shop contained a furnace and tools that the smith and his helpers used in forging various iron article. A bellows (1) blew in air to increase the furnace temperature. An anvil, which was use for hammering hot iron into shape, comprised a tool hole (2), a punch hole (3), a face (4), and a pointed beak (5). The anvil body (6) was set on an elm block (7). A hot coal rake (8) lay with other tools on a tool rail (9). After the red hot iron was shaped by the smith (10) and the Striker (11), it was cooled in the water trough (12). A floor mandrel (13) held other tools in use near the furnace (14).